This contemporary sectional features three pieces that combine to create a unique "L" shape that fits perfectly in your living room. Track arms, tapered wood feet and streamlined cushions create a modern look on this stationary sectional. A left-arm love seat, armless chair and right-arm corner sofa provide plenty of seating space that you'll take advantage of while relaxing or entertaining. Throw pillows add style to the upholstery fabric of your choice. Create your perfect sectional with this versatile piece! The Collegedale Contemporary 3-Piece Sectional by England at Furniture Discount Warehouse TM in the Crystal Lake, Cary, Algonquin area. Product availability may vary. Contact us for the most current availability on this product. 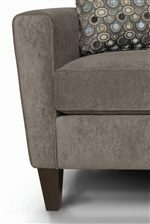 6200-63 RAF Corner Sofa 1 86" 35" 36"
6200-28 LAF Loveseat 1 51" 35" 36"
6200-39 Armless Chair 1 23" 35" 36"
Fabric Options England is a custom upholstery house that offers a selection of over 400 fabrics to create your perfect sofa. Fabric introductions undergo 10 areas of evaluation to insure standards of quality, strength, and durability are achieved before approval as a product cover fabric. Arm Sleek track arms give this collection a contemporary look. Leg or Skirt Tapered exposed wood legs creates a strong base support for each piece in this collection. Frame Construction Durable manufactured hardwood frames are 20% stronger. Seat Support 8 Gauge steel springs are placed closer together for added durability and longevity. Polypropylene plastic spring clips help eliminate spring squeaks. The Collegedale Collection will lend a retro feel to your living space. This collection features sectional seating with versatile options in a variety of configurations, as well as coordinating sofa, loveseat, chair and ottoman. Each piece is small enough to fit almost any family room, yet large enough to accommodate several guests. Clean lines, matching welt, and high tapered legs combine to create an off-the-floor profile. Reversible seat cushions and contrasting accent pillows are standard. Update your current living room with this modern, chic and simple look of the Collegedale Collection. 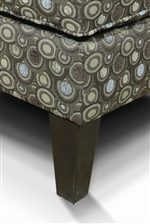 Collegedale is also available in all leather, shown in the Lance collection, or in leather-match, Lynette. The Collegedale collection is a great option if you are looking for Contemporary furniture in the Crystal Lake, Cary, Algonquin area. Sleek Upholstered Track Arm Rests. Browse other items in the Collegedale collection from Furniture Discount Warehouse TM in the Crystal Lake, Cary, Algonquin area.